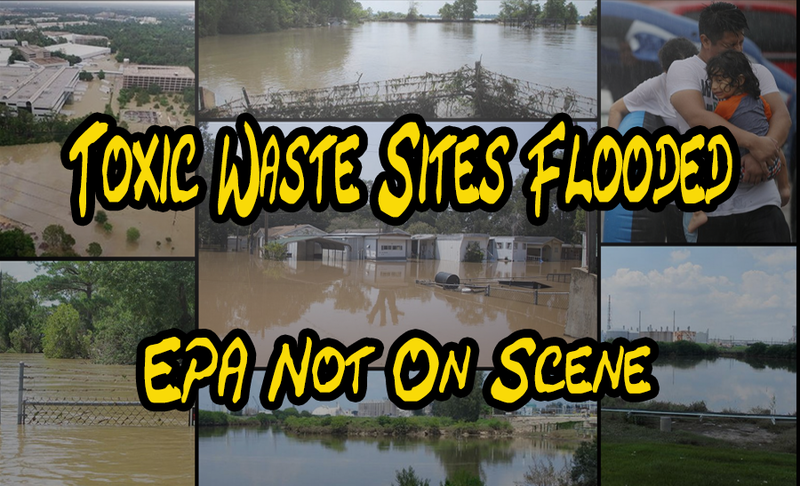 The title of this video is “Toxic Waste Sites Flooded, EPA Not On Scene”. 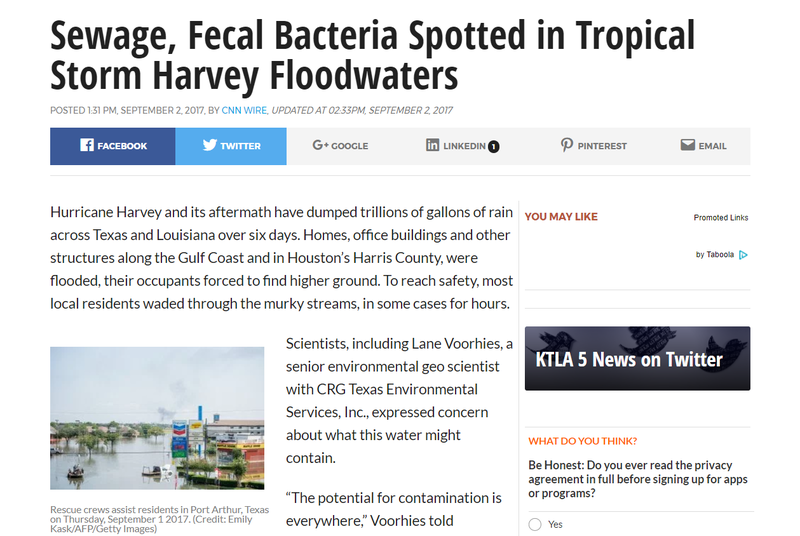 While there is much banter going on about reliable data and real science and whether or not Hurricane Harvey was man-made or a natural disaster; one thing that cannot be ignored is the Aftermath. For months weeks and even years, these folks will be subjected to all manner attacks on their health and well being. They have sheltered over 30 thousand people but this catastrophe has hit Texans in the millions. 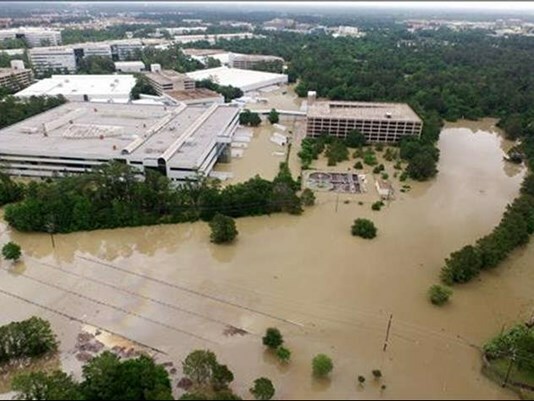 The Federal Emergency Management Agency says 53,630 Texas residents displaced by Hurricane Harvey are currently staying in government-funded hotel rooms. 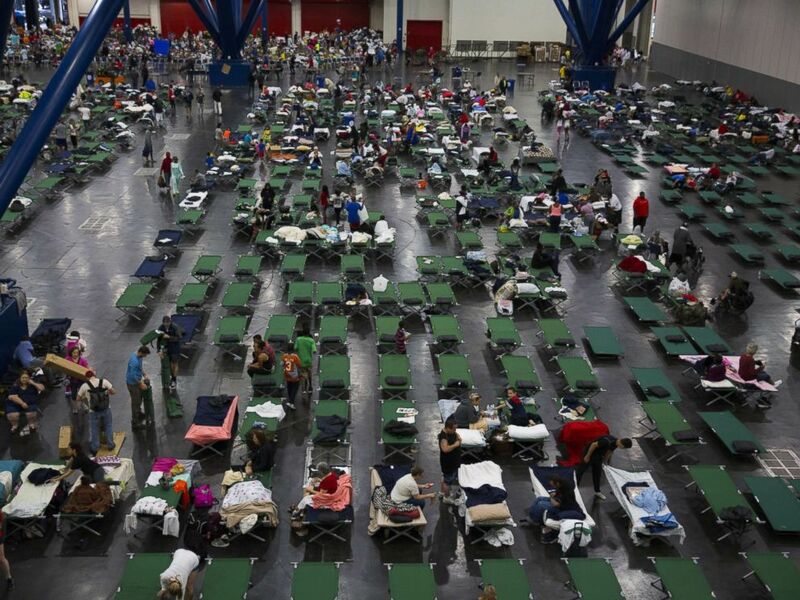 Another 10,000 people take shelter in Houston’s George R. Brown Convention Center. 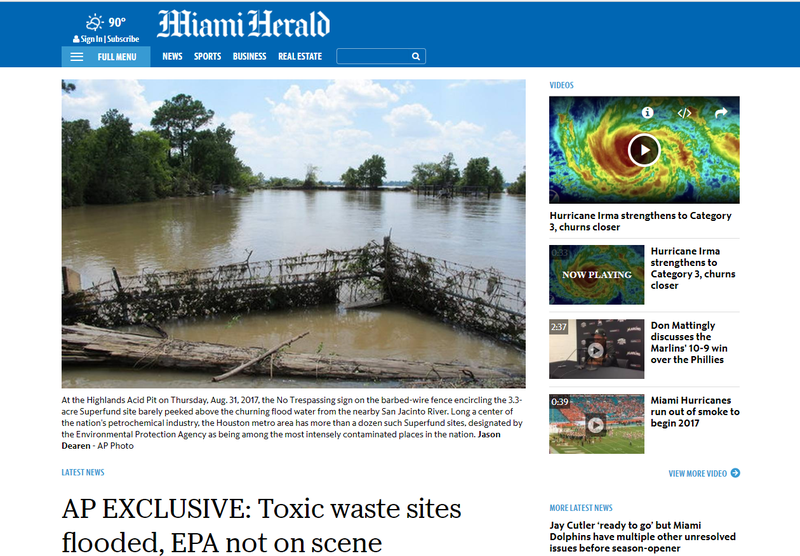 We will look at some headlines affirming that 13 of the 41 Superfund sites are completely flooded and are spewing toxic waste into the already infested water. It’s like a giant swimming pool where everyone, man, woman and child, have jumped into it with all their clothes on, along with trash cans and garbage cans being toppled over, oil and gas leakage from cars, trucks and boats, dogs and cats and other animals releasing themselves in the water, trash piles along with debris destroyed homes, cars, buses, trucks, factories, etc. All that is in the water. You know, one of the dangers of an industrialized environment is the amount of waste that is the outcome of that way of life. The earth becomes a cement jungle as cities pile brick upon brick upon steel beams on top of it. The waterways are relegated to a certain area and when they overflow, they cannot get back home because they cannot seep through the asphalt and cement. Sewers back up and the flooding becomes horrendous. I guess I don’t have to be to graphic here, so use your imagination if you had to go swimming in a pool filled with all that stuff. Water is the universal solvent. But it also houses all kinds of microscopic organisms. If water sits for long periods of time, those organism are nurtured and multiply. We can see mold and slime as a result. 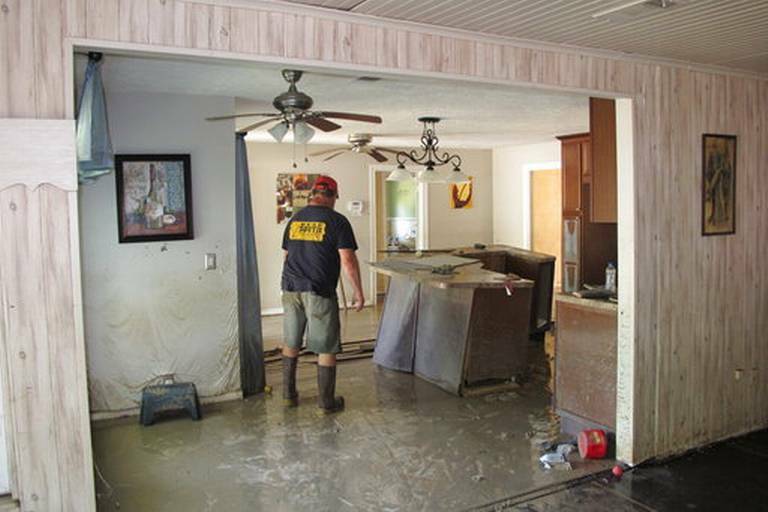 People who are away from the houses cannot clean out or clean up their homes so the mold will begin to grow. And the black mold is quite toxic. through roofs and windows. And we certainly should not assume that these folks had house that were in tip top shape. You know, roofs that did not leak, plumbing that was not rusted or moldy, electrical installations in good shape, refrigerators that worked, electronics that were in waterproof packaging. 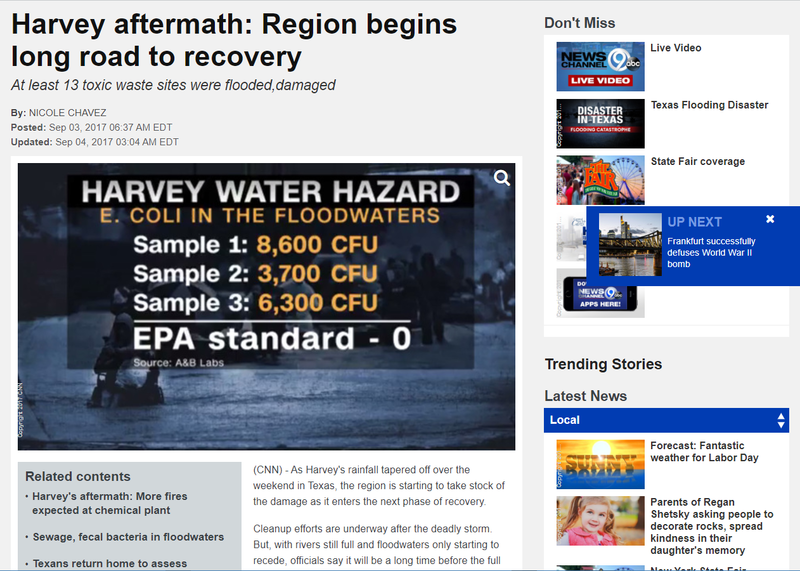 All of this stuff is floating around in that water, and the EPA focuses on E Coli! Interesting, but you gotta love them for telling folks after 911, that the air was safe to breathe. So let’s look at some headlines. This article was heart breaking. The total coliform samples were “huge,” said Sevukan, compared to EPA standards. Coliform bacteria is present in the feces of all warm-blooded animals and humans. Hearing these numbers, Wilma Subra, president of the Subra Company, an environmental consulting firm, audibly gasped. Along with the coliform analysis, Sevukan had three sample test results for E. coli, which is part of the total coliform number: 8,600 CFUs, 3,700 CFUs and 6,300 CFUs. The EPA drinking water standard for E. coli is zero and, according to EPA criteria published in 2012, the recreational water quality standard ranges from 100 to 410 CFUs. “If total coliform and E. coli is high, there’s a definite mixture of sewage in the water,” said Sevukan. Neither bacteria is life-threatening. The E. coli numbers did not make Subra gasp, though she noted they were “very high numbers” as well. 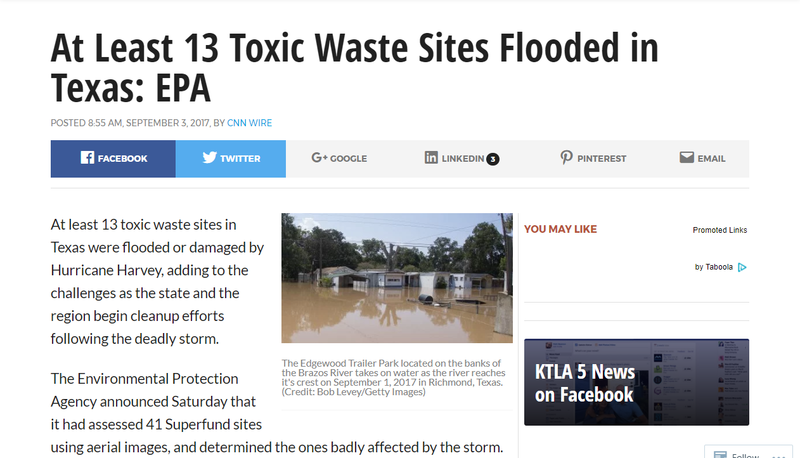 The toxic waste sites are not the first environmental threat Texas has faced since Harvey swept through the region. People living within 1.5 miles from the Arkema site in Crosby were evacuated days before the explosions and now officials are letting chemical containers catch fire and burn out rather than endanger firefighters, the EPA and the Texas Commission on Environmental Quality said in a joint statement. The Superfund sites and the Arkema plant represent just a snapshot of the cascading effects of the catastrophic storm. 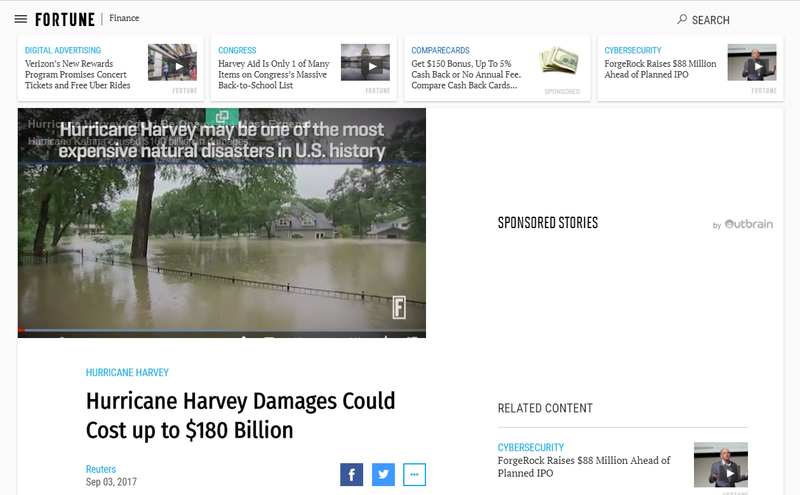 The recovery from Harvey would require even more money than the package Congress appropriated for Hurricane Katrina relief, he said. 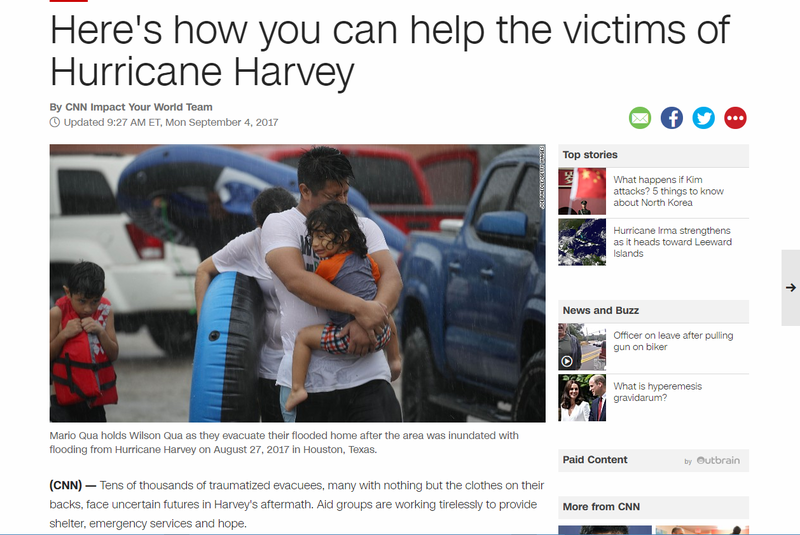 The total population and geographic range affected by Harvey could surpass both Hurricane Katrina and Hurricane Sandy combined, he said. Polk County Sheriff Says "Papers Please!"